and it is working great. 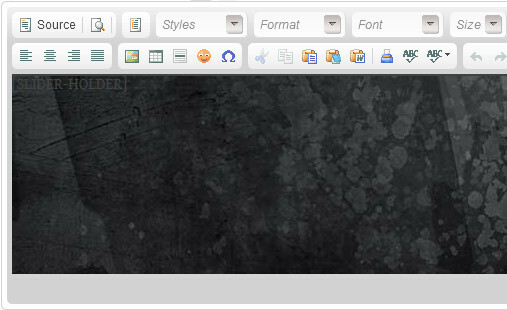 The only thing that is giving me a headache is the background of the CKEditor's text area. The background is showing the image that I have for the background and I will like to have it as a white background and not the background image. Is there a way to change the background color to white without changing my style sheet? This is what is showing up for the editor's background, but I want it to be white instead of the dark marble background. In contents.css you can modify the background color by changing background-color: #fff; When you remove the background color it makes it transparent. It does make it white but it overwrites main-style.css. What I need is to keep all the css code from main-style.css and just overwrite the background color to white.